For my next few blogs, I thought I would concentrate on the oils in the kit, starting with Lavender. In the oiling world, lavender is known as “the swiss army knife.” It has soothing properties and people like to use it to add a clean fresh scent in the room and to put on burns. Inhaling it gives you a relaxed feeling. Peppermint Vitality promotes healthy intestinal function and supports normal digestion. Do you like mint in your tea? Add the peppermint vitality for a minty flavor. You may be wondering what the word “vitality” means when put on an oil label. Vitality is simply a way to distinguish a dietary-grade essential oil that can be added to food or taken in capsule form. Next time, I’ll write about Frankincense and Copaiba Vitality, plus some information on other premium starter kits. Today we continually hear about toxicity and genetically modified foods that we are exposed to everyday. We know this is not good for us, but, I think, some of us feel that there is nothing we can do about it. There is definitely something we can do about it. We can use natural cleaning agents and eat natural foods as much as possible. Luckily, for us there is a company in the U. S. that specializes in natural products. This company is Young Living Essential Oils. It was founded by D. Gary Young, who was looking for non-toxic and natural solutions for living in today’s world. One of these YLEO products is called Thieves. 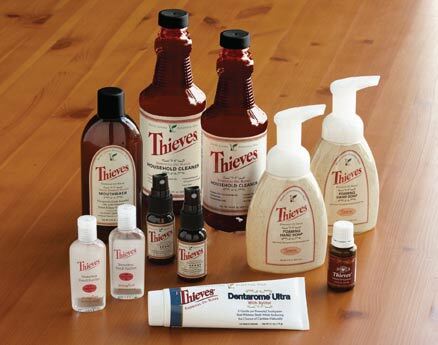 Gary first produced Thieves as an oil and since then has incorporated it into the Thieves product line which includes several products including cleaner, hand soap, throat lozenges and spray. The cleaner is one of my favorite products because I can use it to clean my house without the use of toxic chemicals. So, what is in Thieves you may ask. It is a combination of cloves, cinnamon, rosemary, lemon and eucalyptus – all natural and all capable of killing bacteria and other harmful organisms. Blended together they create a great pleasant smelling and powerful cleaner. And while you are cleaning, you experience the benefit of inhaling the aroma and getting a clean bathroom!! You are probably thinking that Thieves is an odd name for a product that can kill harmful bacteria. Well, here’s the history behind it. In the 15th century, Europe was ravished by a deadly plague. People were dying and the plague was extremely contagious. A group of 4 thieves were robbing the dead and dying, but they themselves seemed immune to the disease. When they were finally captured, the king asked them how they managed to survive being exposed to the plague. They revealed that they used a combination of clove and rosemary and other botanicals which they carried with them and inhaled. Hence, the name Thieves. I invite you to join my mailing list at kathrynfaso@gmail.com or email me if you want more information. Want to get your own Thieves now? Click here youngliving.com/signup to order. Network Marketing is all about connections. The most important connection you can make is with a mentor. Mentors are the key to success. Find the best mentor you can; someone who is walking the walk and talking the talk. I don’t always like clichés but that one fits the bill. Oops, I did it again. Network Marketing is fortunate to have many fantastic and successful mentors. Teri Secrest is one of those mentors. Her book “How to be a Stunning Success in Network Marketing” is an eye opener. As I was reading this book, I made several notes about her message. Confidence and integrity are two of her cornerstones. Believe in yourself and others will believe in you. Your perception of who you are will become reality. So perceive yourself as knowledgeable, confident, successful and influential and others will see those qualities in you. Smile, exude love and light, and don’t judge others are other cornerstones of Teri’s success. People will be drawn to you; then you can connect with them. Network Marketing is all about connections. So here it is – Thanksgiving again. Time to give thanks. I have so much to be thankful for: my family, friends, my Young Living Power Team members, D. Gary and Mary Young. Now just because I might not have mentioned your name specifically, don’t think I’m not thankful for you. I am thankful for everyone I have met and interacted with in my life. You have each contributed to who I am today in some way. Every day is a new adventure and learning experience. Learning is an extremely precious commodity. I see some people repeating the same mistakes over and over. You need to take each experience and learn what you can from it. Don’t spend a lot of time regretting what has happened, grow as a person and move on. I have experienced personal growth in many aspects of my life, including with the Young Living Essential Oils. The oils have had a tremendous impact on my life, both health wise and business wise. Health wise they have helped me enjoy my life and feel good just about every day. Business wise they have made it possible for me to meet amazing people and to work from home. D. Gary Young and his wife, Mary, are an inspiration to me and spending time with them, makes me thankful for people with vision who want to help others. What more can I say? I am so thankful and hope all of you have many blessings to be thankful for also. Fall is a time of transition – the leaves change color, the days get shorter and the temperature starts to drop. We get out our “winter” clothes and put away the “summer” ones (if you live where there is winter). We start preparing for the upcoming celebrations, Halloween, Thanksgiving and Christmas. This year I’ll be making another transition – living without my constant 4 legged companion of the last 14 years, Rex. Rex and I bonded in many ways. He watched over me and helped keep me safe. I never felt alone or lonely when he was around. We would take long walks by the lake and he loved to chase small critters that intrigued him. I could talk to him (no, I’m not crazy) and he would listen intently. A little while ago I wrote in my blog that Rex was getting up in years and was having a hard time getting around. He continued to deteriorate to the point where I had to let him ago. It was the hardest thing I’ve had to do. The house seems so empty now. I really miss him, but, as you’ve heard before, life goes on. So, I will continue to transition from summer to fall to winter and to life without Rex. RIP my sweet friend. This past Friday night I was extremely fortunate to be able to attend an OOLA Dream Tour meeting in Rochester, New York. What an evening! OOLA means balance and the message was about getting and keeping your life in balance. The co-founders of OOLA, Dr. Troy and Dr. Dave, spoke and entertained us for 90 minutes about how OOLA got started and where it is today. When they first formulated their idea two years ago, they approached some companies they thought would be open to collaborating with them. Luckily for us, Gary Young and Young Living saw the powerfulness of this message and agreed to get on board. After Gary heard their whole idea, he developed two oils to start the ball rolling – OOLA Grow and OOLA Balance. That was the start of this great relationship. Now, a little more about the OOLA message and philosophy. There are seven areas in which you should have balance. They are FITNESS, FAITH, FAMILY, FIELD (career), FUN, FRIENDS and FINANCE. Put them in any order you want to, they are all pretty much equal in your life. Troy and Dave’s message was to analyze where you are now in each area (rate yourself between 1-10), decide where you want to be and set 3 goals to help you get there. Pick one of these goals and work on it faithfully. Don’t give up. When you have achieved that goal, work on another one. You can work on more than one at a time, but put your major focus on the one that is most important to you now. Don’t let these obstacles get in your way: envy, laziness, misdirected focus, fear, guilt, anger, or self-sabotage. Use these qualities instead: humility, gratitude, love, discipline, wisdom, passion and integrity. You can google these guys on the internet and see where they might be speaking next. If you want an uplifting and inspiring evening, go hear them speak. The first Young Living Essential Oil I was exposed to was Canadian Red Cedar. I applied it to my wrist in the presence of a Hopi man named Limping Snow Wolf. The year was 1994 and Limping Snow Wolf was traveling around the country to spread the word about the Hopi prophecy. His message was mainly about the need for mankind to open up its mind and regain harmony with nature and each other. Too many people had closed their minds and were making judgments about others and their life styles. These kind of negative thoughts and judgments are counterproductive. We need to listen to information without judging it and keep our hearts and minds open. An open heart and mind will attract people to you in a positive way. Positive thoughts and actions will lead to positive results. The application and inhalation of the Canadian Red Cedar allowed me to be open to the message that Limping Snow Wolf was imparting. I wanted to leave the low frequency that negative judgments brought on behind me and approach each new day on an open, positive note. Unfortunately, we can no longer get Canadian Red Cedar oil but I have found that Cedarwood works in a similar fashion. Use it when you need to open your heart and let positive thoughts rule. This morning I arose at 7 AM. Knowing that sleeping late is not the healthiest practice, I made the decision to start my day much earlier. I have found, in the past, that indecision is one of my greatest enemies, but I wasn’t going to let that happen today or in the future. Since I was up early I decided to go to my favorite place – The Lake, as in Lake Ontario where I grew up. As I drove down the road, I contemplated the first action toward my goal of living at The Lake, which is to sell my house. Now, I have said this before (PROCRASTINATION). Today it was clear. Working with my mentor, Bob Proctor, has greatly increased my decision making process and confidence in myself. It has tremendously boosted me by shifting the patterns in my sub-conscious mind from old habits that gave me old results to the thought patterns and choices required for the creation of my dream. I decided to go to my parents’ house. Once I arrived, I went down to the shore and sat by the lake. A lone SEA GULL swam close by and watched me. As he swam in the water directly in front of me, I remembered that the sea gull represents freedom which is manifested by gliding in the wind. The sea gull takes advantage of the wind and goes where the wind blows. Then, a YOUNG EAGLE flew directly over my head! What a magnificent wingspan he had. He landed in the big burly deep green pine tree out behind the boat shed in my Dad’s yard. OMG, I thought to myself as I spotted him nestled in the beautiful grand expanse of the pine branches. Only his head was visible and he was looking in my direction! I snapped picture after picture of him and then he pumped his mighty wings and flew off. As I walked further toward the edge of the yard along the lake, another YOUNG EAGLE suddenly arose from a tree directly in front of me and flew further down the shore. Exhilaration enveloped me because of these mighty gifts from the Creator today. To me, these were validations of the decisions I had made earlier. FREEDOM (represented by the seagull) comes through VISION (the eagle). VISION comes through DECISION (fueled by faith in GOD). I have studied and studied the great classic, Think and Grow Rich, by Napoleon Hill for many years and for the last year or so I have participated in a club with Bob Proctor who is the greatest practitioner of the principles advocated in this book. This one hour a week has become a disciplined habit and has taught me that you can make something become a habit by making the decision to do just that. I am so very grateful to the Bob Proctor Streaming Club and team. Through his club I have learned that PROCRASTINATION IS AN ENERGY DRAIN. If you fall into the pattern of putting things off until later or tomorrow, you will not accomplish your fullest ambition or potential. Thank you, Bob Proctor, for teaching me how to make decisions and stick to them. And my point? You are in PARTNERSHIP. None of us are alone. What’s not working? What results are you getting? Make a decision to change your life. Your results CAN be different. Get a mentor. I recommend the Proctor Gallagher Institute and Streaming Club. See how it is done and do it. Many of us have faith. Now follow up by learning how to apply it. Break free of past conditioning and worn out expected results. Connect with Bob and the Streaming Club by clicking on this affiliate link. Visit me on my Facebook personal page – Kathryn Faso – and be sure to” like” me at “A BETTER LIFE WITH KATHRYN.” I would love to work with you to help you clarify your dreams. Let me help you manifest your desires. Feel free to browse around my website for additional information and services. I knew nothing about essential oils when I bought my first kit. I bought it to support a friend. I believed in her and her mission. She was spreading the news about vaccines and their dangers, and I was sitting back watching. She had found truth and purpose through the beautiful YL Oils. This friend was Kathy Kouwe, who is now a YL Diamond Leader. Besides Kathy I have been blessed to be mentored by Dr. Gary Young and his wife, Mary. They introduced me to the many concepts, ideas, research and information about essential oils. For eleven years, I have been witness to their hard work, passion, commitment, courage, fortitude, strength and, most of all, FAITH. They have persevered through pain, extreme tiredness, and disappointment. The oils have empowered them to withstand the high winds of change, to grow and prosper. As my association with the YL business grew day by day and even moment by moment, I took leaps of faith like I had never done before! I was HEARING and LISTENING to GOD in my life. Hallelujah. It is the most AWESOME place to be. I was in Harmony with myself through association with a higher level of frequency. Literally, the vibratory rate in my cells increased. Emotionally I began to heal the pain, the bitterness, the resentment and all lower emotions. I found myself able to be more graceful, accepting, more LOVING. I decided I was truly inspired by the GRACE of God in my life that came with my relationship with, first of all, Kathy Kouwe, my teachers, Gary and Mary Young, and, of course, the oils. As I encouraged people to share the oils in that first kit I bought, I noticed that the essential oils were working EVERY time. Folks were coming into my home on a weekly basis, using the oils and seeing results. How can one NOT believe in these oils? How can anyone deny the existence of the ESSENCE of GOD in every drop? Miracles were happening all around me. To this day I hear them in excited surprised tones. I am not surprised anymore like I was in the beginning. And, that’s ok! I am ALWAYS excited for the results! As the re-creation of my life progressed after the fire of 2001, I realized I was getting better. I was attracting wonderful, kind, and gentle people into my life who were seeking what I had to offer. At the same time, I needed what they offered to me, SUPPORT. I am so grateful for my first friends and business partners who believed in me. You see, it is not only about what you offer, it is about who you are. My friend Penny LeClair (she can be found at www.kingdommindsetpractitioner.com) believed in me first. She was my DREAM TEAM PARTNER! Thank you Penny. As my journey began with the Young Living (YL) company, I was EXCITED to open the oils as soon as they arrived. WOW. What a JOY to have Christmas every month or more if you wanted it! That is what it was like. The thrill of discovering new oils and other products that would help not only me, but all the people drawn to me made my heart sing with Joy. As I began to learn more and more, one of the main issues I dealt with was depression. Many of the women who came to my door were in a state of non feeling and wanted to feel better. Looking back now, I see I was in a state of depression myself and, therefore, attracting it! I learned from those experiences that YL Valor on my feet and the blend Joy over my heart improved the emotional side of life for EVERYONE concerned! 🙂 It only was a week before I was thinking more clearly, feeling upbeat and uplifted. I felt GOOD. It is not unusual that we often do not recognize we are depressed as we have forgotten what HAPPINESS feels like! And so, I began the upward spiraling to a higher frequency through the YL Oils! A clearer channel to the Holy Spirit opened up and I could see where I needed to go and how to get there. Be sure to explore for your self. The oils are REAL! God’s love in a bottle. ALL FOR YOU!